MSI announced the GX480, a series of 14" laptops with Intel's Core i5-2410M or Core i3-2310M. These systems offers Windows 7 Home Premium, 1366 x 768 pixel resolution, 1333MHz DDR3, NVIDIA GeForce GT 520M, HDMI, 320/500/6400GB 5400RPM SATA HDD, DVD burner, memory card reader, two USB 2.0 ports, one USB 3.0 port (optional), 802.11b/g/n WiFi, Bluetooth 3.0 (optional), and a 1.3MP webcam. The GX480 measures 343 x 240 x 25.1~31.2 mm and weighs 2.2kg. MSI has introduced its new generation CX480 notebook computer with Intel 2nd generation Core i processor, nVidia GeForce GT 520M discrete graphics card, Time Stamp recovery software, hard drive shock protection, ALS, SRS PC Sound, and a battery that lasts up to 8.5 hours. 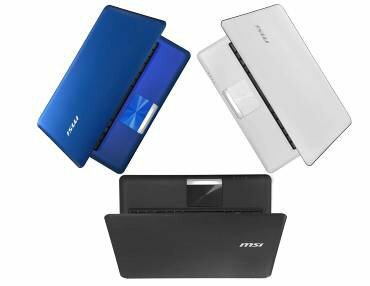 Taipei—MSI unveiled its new generation CX480 laptop, with your choice of black, white, or summery blue as well as MSI's own flat brush finish for an all-new youthfully chic exterior. The new color film print technology gives it character and natural refinement that make it stand out from the crowd. The CX480 is the perfect mobile companion when you're enjoying some summer rays. Eric Kuo, associate vice president for global sales, MSI Notebook, points out that not only is the eye-catching CX480 NB ideal for outdoor use, it packs Intel's high performance second generation Core i processor and nVidia GeForce GT520M discrete graphics card with 1GB DDR3 display memory. In addition, the ALS and ECO technologies give it up to 8.5 hours of battery time per charge, perfect for individuals that don't always have electrical outlets nearby. *Actual battery time will vary with differences in computer use and settings. Brush metal finish: The CX480 has a brush metal finish that exudes a metallic luster, a touch pad with crystal diamond finish, and embedded speakers with layered design. The resultant stylish looks, reminiscent of a sophisticated sports car, make the CX480 stand out from the pack. Pick your color: In addition to black and white, the CX480 also comes in summer blue—a breezy change from the run-of-the mill NBs out there. Now, you can enjoy a notebook computer that brings you summer all year round. One-touch BIOS updates: Updating BIOS is now easier than ever. MSI’s new generation CX480 employs an all-new BIOS update system which allows you to automatically update BIOS under a Windows OS environment with one touch of the BIOS button. No more complicated steps. SRS PC Sound™ cinema-grade sound: The CX480 comes with new generation SRS PC Sound™ for natural wrap around, high fidelity sound whether you use the built-in speakers, external ones, or headsets. This machine is designed to satisfy your craving for crisp, clear sound. USB3.0 and Bluetooth 3.0: USB 3.0 and Bluetooth 3.0 come optional with MSI's CX480. New generation USB 3.0 boasts transfer speeds of 4.8Gbps—10 times faster than USB2.0. Bluetooth 3.0, which has data transfer speeds of 24Mbps, is three times faster than Bluetooth 2.1. In addition, the new generation CX480 notebook computer is equipped with a dust cover for the USB 3.0 and HDMI slots to protect them when they're not in use.